(Newser) – Rex Tillerson's visit to Afghanistan Monday was cloaked in mystery in more ways than one. Following the secretary of state's surprise meeting with Afghan President Ashraf Ghani—which was only reported after the fact—the US Embassy released a photo of the two men seated together in a room with large TV screens, a clock, and a fire alarm visible behind them, giving the location as the capital of Kabul. 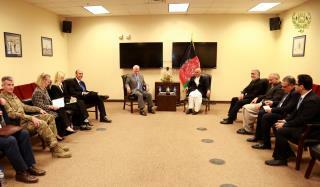 Ghani's office likewise said the pair had met in Kabul. But in the photo it released, the clock and fire alarm had vanished from the wall. As the New York Times reports, the red fire alarm and military-style clock indicated the meeting took place not in Kabul but at the US military base in Bagram, more than 30 miles away. What in God's name makes anyone believe there are 'moderate' Tally? Oops, someone who released the telltale photo made a faux pax. Heads will roll.